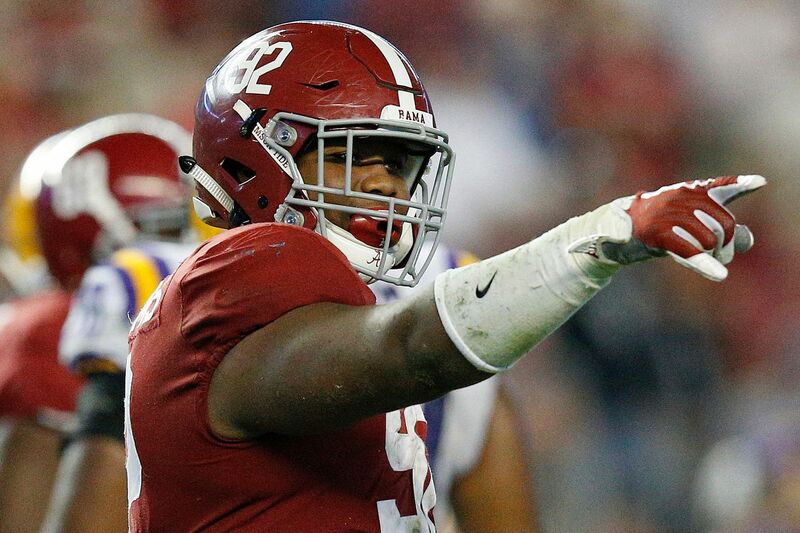 Quinnen Williams projects as a top-five draft pick. Today, in part 8 of our series, he looks at three interior defensive-line prospects. Ben’s take: “He’s the cream of the crop in a very deep group. He’s a powerful disrupter. He can play up and down the defensive line. He has short-area quickness and power. Everybody wants a one-step, explosive defensive tackle, and that’s what he is. “You can’t block him one-on-one. He can get into gaps. He can go through you. He’s a lot like [Ndamukong] Suh when he came out of Nebraska. Suh could play over the nose, 3-tech, on the edge. This guy is a similar player. “He can do whatever you want him to do, in any scheme. But ideally, he’s a one-gap player. I think he’s a guy you want shooting into the backfield, not run-plugging and occupying blockers. “In today’s NFL, everybody wants upfield disrupters. All of this long-developing play-action, jet-sweep, end-around stuff, all of that backfield stuff, it takes time. And what disrupts that is a guy like Williams who can get back there now. “If you saw the wired-up version of the Super Bowl, you heard [Patriots head coach Bill] Belichick telling his guys, ‘Get vertical, get vertical, get vertical.’ He was telling his defensive linemen to get up the field. The Eagles are the same way. Guys like Williams, their value never has been higher." Trysten Hill tackling Navy's Mike Martin during a November game. Ben’s take: “I’ve called Hill a poor man’s Timmy Jernigan. He had some character and maturity issues at UCF. Actually was the backup tackle. Barely played in their bowl game. Had some issues with their coaching staff. “That said, he’s very, very talented. He’s an explosive D-lineman. Played in a staggered track stance and shot into backfields. Jolted and shocked offensive linemen with his get-off across the line of scrimmage. “He showed up at the combine and was incredible. Displayed all the movement patterns, all the jumps. He was explosive. Has really good body control. “The biggest questions with him are the character and maturity issues and the fact that he was a backup as an upperclassman." Khalen Saunders impressed at the Senior Bowl. Ben’s take: “He’s that dancing-panda type of guy with a big, wide waist and body and these little pencil legs. At Western Illinois, they would stand him up on off the edge at 320 pounds. He’s fun to watch. “He’s disruptive. He’s athletic. When they played Illinois last year, he was very disruptive and strong at the point of attack. He wins with athleticism and short-area quickness in the trenches. He can jump around offensive linemen. “He shined at the Senior Bowl. If it wasn’t such a deep interior line class, he might even be a Day 2 guy."